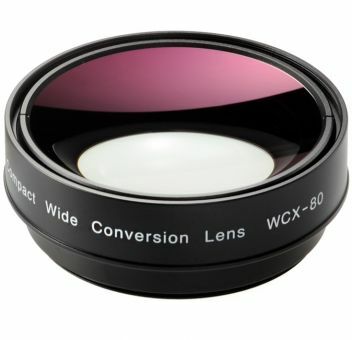 The high quality WCX-80 wide converter lens from Zunow provides x0.8 magnification for wide-angle shooting with full zoom through capability and minimal barrel distortion. Whether you’re shooting landscapes or working in tight areas, the WCX-80 opens up the scene and allows you to get 20% more view into your frame. It can be used in virtually any shooting environment while preserving the highest quality images with exceptional sharpness. This wide converter lens of the Japanese company Zunow works great with several Sony and JVC camcorders but also with a large range of Canon lenses. View the attached compatibility chart for the corresponding cameras. Attach the WCX-80 to the 72mm or 62mm front thread on your lens and start shooting. You can even attach 82mm filters onto the front lens mount for added protection and image quality. Weighting only 285g (0.63 lbs) this lens has been elegantly engineered in Japan and crafted without sacrifice in quality. The lens is fully compatible with popular mattebox systems such as the Alphatron Mattebox 4x4 for a proper shading solution. Zunow also offers the optional Zunow HU-85 rubber lens hood to prevent unwanted stray light from entering the lens.